I am not a very artistic person, so when I find designs that are really easy to execute, I am so stoked. Doesn’t this design look like a million bucks? If I saw this cake somewhere, I would definitely be impressed, but it took about 10 minutes to decorate and was SO easy. You’ll see exactly what I mean. I have the recipe for the frosting and the cake, so check those out, Chocolate Strawberry Layer Cake. 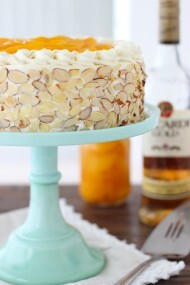 Start by frosting the cake with a thin layer of frosting, to make the surface smooth and even. 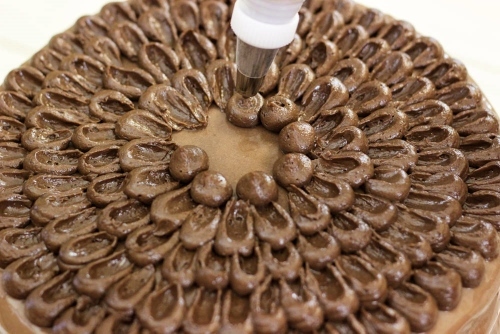 Place the frosting that you’ll be using for the chocolate petal design in a piping bag fitted with a large round tip. Pipe out small dots all around the edge of the cake. 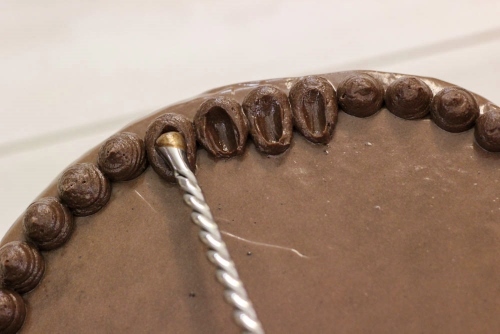 Since I was making really small petals, I used the tip of a small teaspoon to swipe down from the middle of the circle towards the center of the cake. If you want to make bigger petals, you can use a small straight edge spatula. 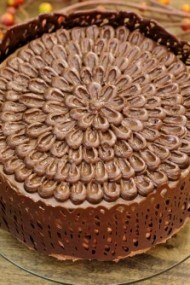 Repeat with another layer of dots and go all the way around the cake. Finish with one dot in the center. 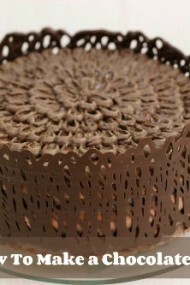 For a detailed tutorial on how to make the Chocolate Cage/border around the cake, click HERE. AMAZING! i love to decorate but never have time as a mom for fancy time consuming cakes, this is perfect .I can surprise my husband on his birthday with this. oh and the chocolate cage too! thanks so much Olga i love your site when ever i run out of ideas! I’m so glad this technique caught your eye. The less fuss and time in decorating, the better, in my opinion. Have fun on your husband’s birthday. I usually do a simple party for my husband’s birthday, but this year we threw him a surprise party. You can read more about it here. It was a lot of fun. The frosting recipe is included in the cake recipe, Hasena. The link for the cake recipe is in this post. Hi Olga! 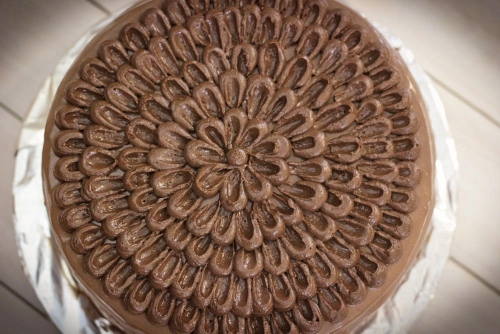 Could I simply omit the cocoa powder and make this frosting vanilla and it would still pipe and make a petal design just as well? I am making a sea themed cake and wanted to pipe it on the sides. Do you think it would hold well? Thanks! Hi Alla. Yes, you can omit the cocoa powder. It should work out just as well, since it’s not giving structure to the frosting, just flavor.